AINesting - it is eCut nesting feature ported to work with 'ai' files. AINesting - it is separate program and can be used not only with adobe illustrator, but with any vector software wich can import/export AI files. 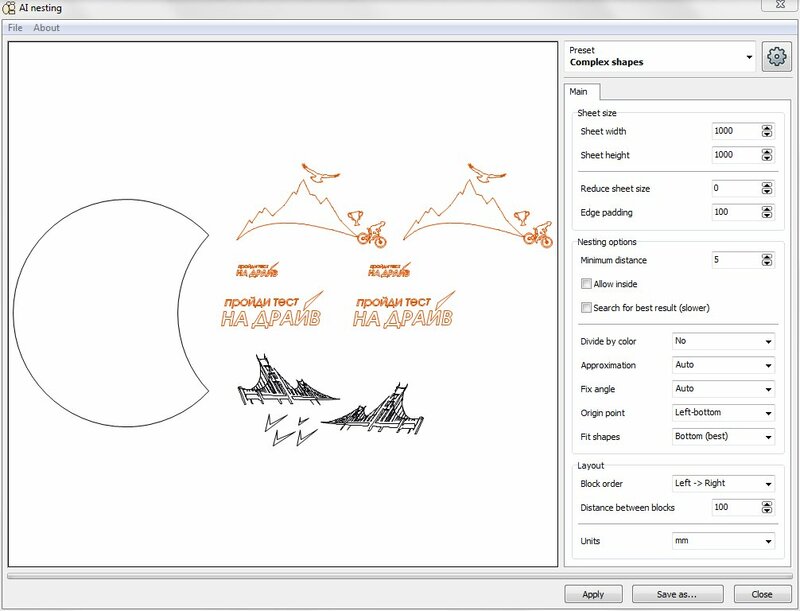 This very powerful program will help You to prepare object for plotter or CNC machine! In few seconds nesting function can allocate selected objects on specified sheet. New 2.0 version was ported from eCut6 and it has more features. 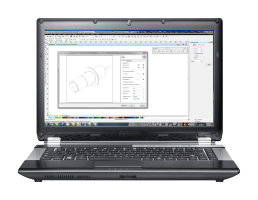 This is very powerful function helps You to prepare object for plotter or CNC machine! In new version You can see result of nesting without need to return to Corel! You can change parameters of nesting and try to nest objects again and again. And when result will be fine for You, You can apply all changes in Corel. You can zoom-in and zoom-out preview, select objects and change its parameters, like 'use as container'. Sheet width and height - size of material. Reduce sheet size - you can reduce all sheet sizes (L,R,T,B). Edge padding - allows you to set empty space between nested objects and sheet boundbox.. Minimal distance - minimal distance between two shapes that can be achieved. Allow inside - let function to put small objects inside big ones. Search best result - let function to make few results and show only best (slower). Origin point - nesting origin point. Fit shapes - how to nest. I want to add some recommendations that will help you when working with the program. Text nesting - always set approximation to Middle or Low, and Fix angle = 90 deg. I will force program to rotate text only on 90 degrees, and in this case result will be better. Complex shape nesting - set approximation to Auto. Also, if you see bad nested shape - click on it and set Fix angle = No - it can help. If you have time - activate searching best result, it will reduce process time, but will make result better. To set shape container - select it in preview and in popup menu set 'Use as container'. Note: this tutors was taken from eCut6, and here you'll see some CorelDRAW leafs.